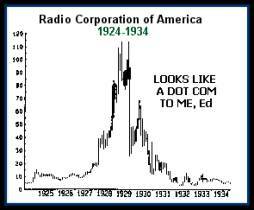 Black Tuesday October 29th 1929 Revisited? Note: This article was originally posted October 29, 2002, when US stocks were in the midst of a severe market crash. We believe everyone should carefully review the present update as another CRASH may be brewing on the horizon. History would suggest that once every couple of generations there is a “cleansing cycle” that occurs within the financial markets, society, and even within humanity as a whole. Financial institutions collapse, diseases rage, locusts fly, hailstones fall, earthquakes increase, volcanoes rumble, sunspots explode out from our heat source, wars breakout all over and despotism reigns supreme. We appear to be entering one of these historic cycles at this seminal point in the maturation of the human race. Almost as if the entire planet is vibrating out of control, has some kind of harmonic resonance pushed us out of kilter, like we are getting disconnected from our core and spiraling out of control? Maybe it’s our collective lack of moral backbone precipitating these events, as historically, such perilous times tend to follow a period of wild excess. The last time this happened was in the 1920’s, 30’s and 40’s. It started with the Wall Street Crash of 1929, then it moved through to the Great Depression and ended beyond World War II. The question is -- is it cyclically returning? 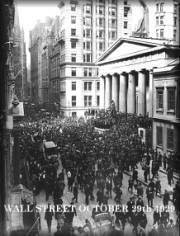 On Tuesday October 29th, 1929, Wall Street witnessed a 13% decline in the Dow Jones, an episode that became known in financial mythology as “Black Tuesday.” It is generally recognized that Black Tuesday was the beginning of the Great Depression. Between early September and the end of October 1929 the market lost a total of 40% in less than 8 weeks. In reality, Black Tuesday was just the end of the beginning of the crash on Wall Street. As you can see from the graph, the market continued to fall for several years after Black Tuesday. By the end of the slide some pundits conjectured that the market might actually go to zero. From its high of 386.10 in September ’29 to its low of 40.60 on July 29, 1932, the market had lost a total of 89%! So, the definition of Black Tuesday is the touchpoint of the biggest economic crash the world has ever witnessed. In the weeks and months leading up to Black Tuesday, the general sentiment was the economy was strong, if not at least stable, and there was little to be concerned about. "Stock prices have reached what looks like a permanently high plateau. I do not feel there will be soon if ever a 50 or 60 point break from present levels, such as (bears) have predicted. I expect to see the stock market a good deal higher within a few months." After the crash on Black Tuesday, there were many whom disagreed with the significance of what was occuring and remained optimistic. "Secretary Lamont and officials of the Commerce Department today denied rumors that a severe depression in business and industrial activity was impending, which had been based on a mistaken interpretation of a review of industrial and credit conditions issued earlier in the day by the Federal ReserveBoard." "This is the time to buy stocks. This is the time to recall the words of the late J. P. Morgan... that any man who is bearish on America will go broke. Within a few days there is likely to be a bear panic rather than a bull panic. Many of the low prices as a result of this hysterical selling are not likely to be reached again in many years." "...despite its severity, we believe that the slump in stock prices will prove an intermediate movement and not the precursor of a business depression such as would entail prolonged further liquidation..."
"The worst is over without a doubt." "We have hit bottom and are on the upswing." What happened on that day is little understood and highly controversial. What history suggests is that the mass of investors capitulated, in essence said, “enough is enough,” and ran from the market, most of them never to return. But there is another version of events that needs to be understood. During the roaring 20’s there existed a climate of “irrational exuberance” and speculative excess (does this sound familiar to you?…Ed.). New fangled technology, like the radio (RCA) and the car (Ford started mass production) coupled with real estate speculation, especially in Florida (like the Ponzi Scheme), created an economic temperament of “get rich quick.” Jazz was all the rage and clubs were starting up in the major cities. Life, in general, was good in America, although poverty was very evident. Stock prices were run up to excessively high levels, which everyone knew (so we are told) were unsustainable. For the first time in investing history the masses of investors were allowed to borrow on the margin in order to buy stocks. Industrial production was rising, and this fueled the speculation. However, production and GDP were rising at a much slower rate than the stock market. 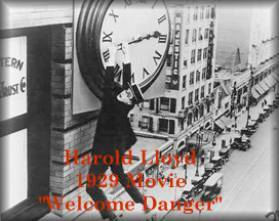 In order to add a little Hollywood spice to this version of history, below is the voice-over from the opening to a 1939 classic “The Roaring Twenties” starring Cagney, Lane and Bogart . (1929) As the dizzy decade nears its end, the investors go stock market crazy. The great and the humble, the rich man and the workingman, the housewife and the shopgirl, all take their daily flyer in the market. And no one seems to lose. Then like a dark bombshell, fortune drops that never-to-be-forgotten Black Tuesday, October 29th. Another echoing of this version of history comes from establishment economist John Kenneth Galbraith's narrative on the time, The Great Crash: 1929. Then all of a sudden, on Black Tuesday, the rug was pulled out from under the feet of the market. The masses lost faith in the value of stocks and opted to sell -- all at the same time! This caused a panic. Stocks started to decline precipitously, leading to more selling. Investors couldn’t pay the interest on their margin accounts causing the banks that had loaned the money to go out of business. The house of cards came tumbling down and we have no one to blame but our own greediness and desire to be rich without having to work for it. It’s really that simple or so we are told. 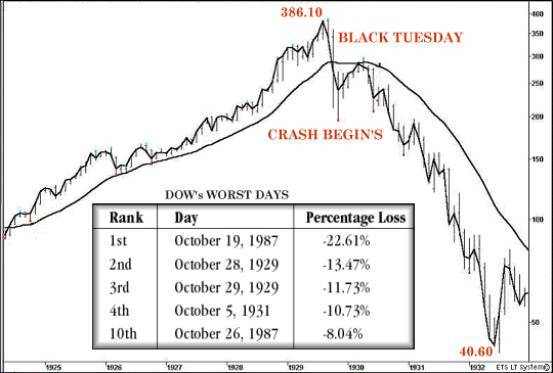 Black Tuesday had such an impact that the market did not recover from the lows of 1929 until 1954, long after WWII, 25 years later! “A veritable bedlam of activity reigned in leading stock brokerage houses in Seattle today as the greatest avalanche of security selling known to history was launched on New York exchanges. Executives and clerks, worn by almost constant application to duty for days past, and with little respite gained by the Saturday afternoon and Sunday intermission breasted the great tide of buying and selling orders with philosophical resignation. And the orders poured in from the floors of the board houses, over teaming batteries of telephones, and by telegram … Curiosity seemed to prompt attendance of the greater part of the milling throngs in the board rooms.” (The Seattle Times, October 29, 1929). In conclusion, version one depicts a kind of orderly human crisis brought about by “the people” – our greed and ignorance drove us to want something for nothing and ultimately ended in disaster, the Great Depression. To understand this version of what happened on Black Tuesday it is imperative to learn some of the history of the Federal Reserve Bank system of the United States, where it came from, the powers it possesses, and how it uses them to affect the economy and markets. This is not an easy subject. Fundamentally, the alternative history suggests that banking manipulations caused the irrational exuberance, thus the speculative excesses, the Crash of 1929 that followed, and therefore the Great Depression of 1933, which then ultimately lead to World War II. In order to present this alternative view it is necessary to quote from an expert source from the era. There is no more respected and outspoken source on banking in that period than Congressman Louis McFadden. Here’s some background on Pennsylvania Congressman Louis McFadden and his expert opinion on the Federal Reserve. Louis Thomas McFadden was born in Troy, Bradford County, Pennsylvania on October 1, 1876. He attended public schools and a commercial college. At sixteen he took a job as office boy in the First National Bank in Canton, Pennsylvania, a small town near his birthplace. Seven years later he was a cashier, and in 1916 he became the president of the bank. Meanwhile, in 1898 he had married Helen Westgate of Canton, by whom he had three children, two sons and one daughter. His political career began in 1914 when he was elected to Congress as Republican representative from the 15th district. In 1920, he was appointed chairman of the influential House committee on Banking and Currency, a position he held until 1931. During his tenure on the committee he learned first hand about the Federal Reserve Bank system, its owners and operators, and subsequently became quite passionate about the subject! “In 1912 the National Monetary Association, under the chairmanship of the late Senator Nelson W. Aldrich, made a report and presented a vicious bill called the National Reserve Association bill. This bill is usually spoken of as the Aldrich bill. Senator Aldrich (Grandfather to the Rockefeller brothers, Ed) did not write the Aldrich bill. He was the tool, but not the accomplice, of the European-born bankers who for nearly twenty years had been scheming to set up a central bank in this country and who in 1912 had spent and were continuing to spend vast sums of money to accomplish their purpose. The Aldrich bill was condemned in the platform upon which Theodore Roosevelt was nominated in the year 1912, and in that same year, when Woodrow Wilson was nominated, the Democratic platform, as adopted at the Baltimore convention, expressly stated: ' We are opposed to the Aldrich plan for a central bank.' This was plain language. The men who ruled the Democratic Party then promised the people that if they were returned to power there would be no central bank established here while they held the reigns of government. Thirteen months later that promise was broken, and the Wilson administration, under the tutelage of those sinister Wall Street figures who stood behind Colonel House (Author of "Philip Dru, Administrator' Ed), established here in our free country the worm-eaten monarchical institution of the 'king's bank' to control us from the top downward, and to shackle us from the cradle to the grave. " "The Federal Reserve act destroyed our old and characteristic way of doing business; it discriminated against our one-name commercial paper, the finest in the world; it set up the antiquated two-name paper, which is the present curse of this country, and which wrecked every country which has ever given it scope; it fastened down upon this country the very tyranny from which the framers of the Constitution sought to save us. " "The danger that the country was warned against came upon us and is shown in the long train of horrors attendant upon the affairs of the traitorous and dishonest Federal Reserve Board and the Federal Reserve banks are fully liable. This is an era of financed crime and in the financing of crime; the Federal Reserve Board does not play the part of a disinterested spectator." "It has been said that the draughtsman who was employed to write the text of the Federal Reserve bill used a text of the Aldrich bill for his purpose. It has been said that the language of the Aldrich bill was used because the Aldrich bill had been drawn up by expert lawyers and seemed to be appropriate. It was indeed drawn up by lawyers. The Aldrich bill was created by acceptance bankers of European origin in New York City. It was a copy and in general a translation of the statutes of the Reichbank and other European central banks." Basically McFadden is saying that the creation of the Fed was unconstitutional, that it handed the powers of money/debt creation to a cabal of private bankers, effectively took the US off the gold standard, and lead to excesses that could/would be disastrous. Here are a few more excerpts from various speeches he made regarding the Fed and the Great Depression. "No man and no body of men is more entrenched in power than the arrogant credit monopoly which operate the Fed. What National Government has permitted the Fed to steal from the people should now be restored to the people. The people have a valid claim against the Fed. If that claim is enforced the Americans will not need to stand in the bread line, or to suffer and die of starvation in the streets. Women will be saved, families will be kept together, and American children will not be dispersed and abandoned. "Some people think that the Federal Reserve Banks’ a United States Government institution. They are private monopolies, which prey upon the people of these United States for the benefit of themselves and their foreign customers; foreign and domestic speculators and swindlers; and rich and predatory moneylenders. In that dark crew of financial pirates there are those who would cut a man's throat to get a dollar out of his pocket; there are those who send money into states to buy votes to control our legislatures; there are those who maintain International propaganda for the purpose of deceiving us into granting of new concessions which will permit them to cover up their past misdeeds and set again in motion their gigantic train of crime." "These twelve private credit monopolies (the Regional Fed Banks, Ed) were deceitfully and disloyally foisted upon this Country by the bankers who came here from Europe and repaid us our hospitality by undermining our American institutions. Those bankers took money out of this Country to finance Japan in a war against Russia. They created a reign of terror in Russia with our money in order to help that war along. They instigated the separate peace between Germany and Russia, and thus drove a wedge between the allies in World War I. They financed Trotsky's passage from New York to Russia so that he might assist in the destruction of the Russian Empire. They fomented and instigated the Russian Revolution, and placed a large fund of American dollars at Trotsky's disposal in one of their branch banks in Sweden so that through him, Russian homes might be thoroughly broken up and Russian children flung far and wide from their natural protectors. They have since begun the breaking up of American homes and the dispersal of American children. ' Mr. Chairman, there should be no partisanship in matters concerning banking and currency affairs in this Country, and I do not speak with any.' "
This speech would appear to point to a “smoking gun” regarding the mysterious financial events that led to the Crash of ‘29. It finds a culprit in the Federal Reserve that financially choked the American people in order to line the pockets of its member banks. Could this be the alternative reason for the Depression? McFadden contends that the crash and depression were brought on by the actions of the Fed, that through its greed (or some other unknown agenda) it usurped control of the central banking authority of the United States government, ran up huge debts to its international banking partners, bankrupted the country and then subsequently forced the American taxpayer, through the (technically) illegal income tax system, to repay the debt over the following 20+ years! On May 23, 1933, Congressman Louis T. McFadden brought formal charges against the Board of Governors of the Federal Reserve Bank system, The Comptroller of the Currency and the Secretary of United States Treasury, for numerous criminal acts, including but not limited to, CONSPIRACY, FRAUD, UNLAWFUL CONVERSION, AND TREASON. The petition for Articles of Impeachment has thereafter been referred to the Judiciary Committee and has YET TO BE ACTED ON. Congressman Louis McFadden died a mysterious death in 1936. The only reference I could find of it comes from the excessively right wing rag of the time, “Pelley’s Weekly,” that stated on Oct. 14th: “Now that this sterling American patriot has made the Passing ……it became known among his intimates that he had suffered two attacks against his life. The first attack came in the form of two revolver shots fired at him from ambush as he was alighting from a cab in front of one of the Capital hotels. Fortunately both shots missed him, the bullets burying themselves in the structure of the cab. He became violently ill after partaking of food at a political banquet at Washington. His life was only saved from what was subsequently announced as a poisoning by the presence of a physician friend at the banquet, who at once procured a stomach pump and subjected the Congressman to emergency treatment." Ron Paul was born and raised in Pittsburgh, Pennsylvania. He graduated from Gettysburg College and the Duke University School of Medicine, before proudly serving as a flight surgeon in the U.S. Air Force during the 1960s. He and his wife Carol moved to Texas in 1968, where he began his medical practice in Brazoria County. As a specialist in obstetrics/gynecology, Dr. Paul has delivered more than 4,000 babies! He and Carol, who reside in Surfside Beach, Texas, are the proud parents of five children and have sixteen grandchildren. In the words of former Treasury Secretary William Simon, Dr. Paul is the "one exception to the Gang of 535" on Capitol Hill. He has served on the House Banking committee, where he was a strong advocate for sound monetary policy and an outspoken critic of the Federal Reserve's inflationary measures. He also was a key member of the Gold Commission, advocating a return to a gold standard for our currency. He currently serves on the House of Representatives Financial Services Committee, and the International Relations committee. Dr. Ron Paul is well known in Congress for his running battle with Fed Chairman Alan Greenspan. In 1966, Greenspan, personal friend of Ayn Rand at the time, penned a famous essay on the gold standard entitled “Gold and Economic Freedom." Interestingly, in it he stated opinions and views of the Crash of ‘29. " When business in the United States underwent a mild contraction in 1927, the Federal Reserve created more paper reserves in the hope of forestalling any possible bank reserve shortage. More disastrous, however, was the Federal Reserve's attempt to assist Great Britain who had been losing gold to us because the Bank of England refused to allow interest rates to rise when market forces dictated (it was politically unpalatable). The reasoning of the authorities involved was as follows: if the Federal Reserve pumped excessive paper reserves into American banks, interest rates in the United States would fall to a level comparable with those in Great Britain; this would act to stop Britain's gold loss and avoid the political embarrassment of having to raise interest rates. The "Fed" succeeded; it stopped the gold loss, but it nearly destroyed the economies of the world, in the process. The excess credit which the Fed pumped into the economy spilled over into the stock market triggering a fantastic speculative boom. Belatedly, Federal Reserve officials attempted to sop up the excess reserves and finally succeeded in breaking the boom. But it was too late: by 1929 the speculative imbalances had become so overwhelming that the attempt precipitated a sharp retrenching and a consequent demoralizing of business confidence. As a result, the American economy collapsed. Great Britain fared even worse, and rather than absorb the full consequences of her previous folly, she abandoned the gold standard completely in 1931, tearing asunder what remained of the fabric of confidence and inducing a world-wide series of bank failures. The world economies plunged into the Great Depression of the 1930's." So here we have the current Federal Reserve Chairman admitting in a 1966 essay, prior to his involvement with the government and the Fed, that “excess credit” pumped by the Fed into the economy caused a speculative boom that resulted in a crash and then a depression! Ron Paul said in a recent interview with Donald Luskin of Capitalist Magazine when asked what he would do about the current system, “What would we do for money?" Paul says, "Get the government out of money. Let the market determine it. Let American Express extend credit and decide what they want to back it with. But that's sort of idealism… so if the government is going to be involved, then government should just maintain the integrity of the monetary unit. Government should define the dollar as a weight in gold and maintain it. If I'm the Secretary of Treasury, I shouldn't issue the currency unless I've got the gold." "So now we see, at last, that the business cycle is brought about, not by any mysterious failings of the free market economy, but quite the opposite: by systematic intervention by government (Fed) in the market process. Government intervention brings about bank expansion and inflation, and, when the inflation comes to an end, the subsequent depression-adjustment comes into play". OK, that ends Version Two, the Unofficial History. I know it was long and hard reading, but if it were easy it would probably be the Official History!! "O SON OF BEING! Busy not thyself with this world, for with fire We test the gold, and with gold We test Our servants." I do realize that I have presented here far more evidence for the “Unofficial History” of the Crash of ‘29 and subsequent Great Depression – however it is worth noting that history, in general, has grossly underestimated the cause of both – and our children’s text books bare witness to this fact. As I write, we are in the midst of a record breaking dead cat bounce: all of the markets globally are in their fourth day of a massive bear market rally that is pumping confidence and the desire to re-invest; and not “miss” the expected economic recovery. Today (Oct 15th 2002) the DOW finished up 378.28 points or 4.8% - one of the biggest bear market rallies of all time. In the past 4 trading days the markets have recovered approximately 10% of their value (see chart below). 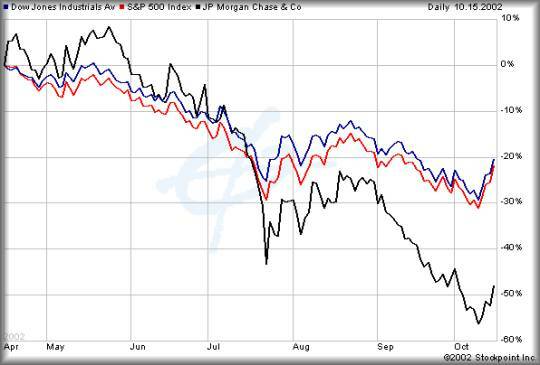 I have included the stock price of J P Morgan Chase Bank in this chart, as they have been very instrumental over time in plunge-protecting the markets. 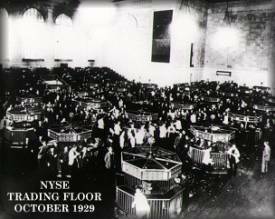 During the Crash of ’29 here is what happened: On Thursday October 24th 1929 at 1:30 p.m., during panic selling on the trading floor," Richard Whitney, vice-president of the New York Stock Exchange and floor broker of J.P. Morgan and Company, walked onto the stock exchange floor. Silence descended over the crowd. Everyone expected Vice-President Whitney to announce an early closing for the market; instead, as representative of the House of Morgan, he asked for the latest bid on U.S. Steel. "195," someone shouted. Whitney promptly announced he was buying 10,000 shares at 205." With JPM shares off nearly 50% so far this year, due to various scandals surrounding the Derivative Mountain they sit on top of, amongst others, it appears very doubtful that they will have the clout to bale out the market this time around! It does seem highly unlikely that we are in the midst of a recovery at all, the fundamental economic metrics all point to a continuing decline into the 2nd Great Depression. History shows us that excessive loose monetary policy, which we have experienced throughout the 1990’s and early 2000’s, leads to a correction of equal proportions, or even worse! Is the cycle repeating? Given the extent of the easy money pumped into the US and world economies, it is a pretty safe bet that this market rally will be short-lived. None of us want to believe this, or indeed see this come to pass – however, through educating ourselves we can at least mitigate for some of the suffering these kinds of conditions invariably bring to pass. Could it be that we will even see a second Black Tuesday? Clearly, there is a mountain of information out there that can be accessed about these difficult and often “dismal” topics. However, it is imperative that we, as citizens of the “free” world, use our God-given powers to independently investigate the truth for ourselves. This requires commitment, time, diligence, passion, and desire. We are all born with these qualities, let's use them! I am convinced that ONLY a spiritual solution can fix these seemingly insurmountable human problems. No amount of political will or secular kindness is now going to be enough to remedy a situation that is spanning the entirety of humanity and threatens the peace and security of all peoples. The good news in all of this is that after the storm there is a lull. The forces of evil (in our definition “man’s inhumanity to man”) run their course. Belief and Faith in One God, One People, reinvigorates the people. The innate goodness (nay greatness) of our species takes back the reigns. Great things can be accomplished in the world and massive progress made across the spectrum of human activity. Black Tuesdays are just precursors to White Wednesdays! They are as necessary as winter storms, forest fires and market capitulation. Never fear for the future; stay focused on the present; learn from the past and have faith that everything happens for a reason! A worthwhile and illuminating read on the Great Depression is Barry Eichengreen's "Hall of Mirrors: The Great Depression, The Great Recession, and the Uses and Misuses of History". Read reviews on Amazon.